Back in 2013 during an emergency trip to the the hospital for Paul’s kidney stone, we asked a neighbor to visit our house and check in on Doctor late in the evening. When the neighbor came to walk him, Doctor wormed his way out the door and escaped into the night. The neighbor immediately called me to tell me of his escape and I drove back from La Mesa to search for Doctor. I recall approaching our driveway and seeing a group of people with flashlights, holding dog treats waiting for my arrival. Doctor was spotted at Mt. Acadia park, a location on our walking route, and last seen by the pool in our community. I called out his name three times and he rushed from the surrounding area and pounced on me. From that moment, I knew that if we weren’t around, Doctor was a possible flight risk with the sole purpose of looking for us. For our Alaska trip, we relied on Rover.com. Our last two experiences were great. The sitters sent frequent updates, knew of our concern about him being a flight risk and knowing he was sleeping in a home rather than a kennel was a comfort for us. Unfortunately, the two previous sitters were not available this time around and we chose another who lived less than a mile from us. We met with her with explicit directions, verbal and written, to always put Doctor in the crate when the front door was opened. Yet, when we dropped left Doctor on Wednesday, October 10 around 5:30 PM, things didn’t go as expected. After dropping Doctor off, Paul and I went to grab a smoothie in Mission Valley and went directly home afterward to pack for our early morning flight to Anchorage. A frantic phone call came in at 6:31 PM that Doctor had run away. What happened after that phone call was a little hazy. I know that Paul and I drove to the sitter’s house and waited for her return with details. She said she had door open only a foot wide when Doctor squeezed through and bolted. He allegedly nipped her in the pursuit and was last seen headed toward the canyon on the back side of Mt. Etna Park. We drove back home with plans to each take a car and look for him. My neighbor, who had seen us rush off to the sitter, saw a post on NextDoor.com that a dog was spotted on the corner of Balboa Ave. and Clairemont Dr. hit by a car; we drove to that area. Paul returned to the sitter’s neighborhood park and searched into the canyon for him, aided by an area resident who was present for the 40-minute chase. The rest of the updates throughout the night came through NextDoor.com including a second update that a black and white dog was seen near the high school at Clairemont Dr. and Balboa Ave. While driving up and down that street, we called him name. During that time, I also made two phone calls: to my co-worker (she’d lost and recovered her dog in La Mesa and would know what to do next) and Babs Fry. I’ve been a fan of Babs Fry since earlier this year, following her stories of finding dogs but I never thought I would have to use her. 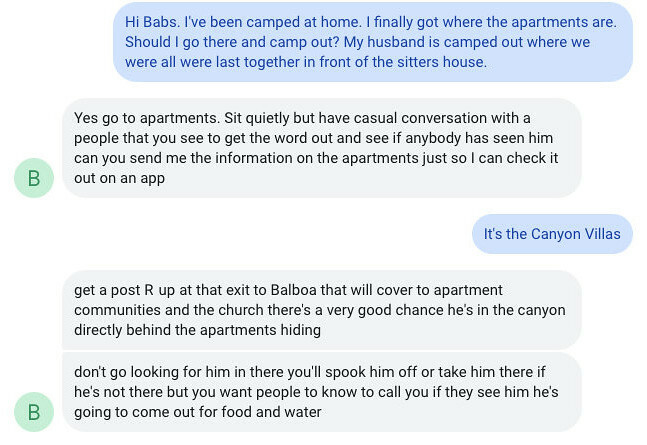 When my neighbor and I returned home, Babs returned my call asking for the address of his last location (the sitter’s address) and already started monitoring his potential sightings on NextDoor.com. Babs gave very specific jobs for us to do that evening: one of Doctor’s “parents” needed to wait at home with the front door wide open and the other “parent” needed to wait at the sitter’s with a trail of our cut-up, unwashed laundry creating a trail connecting both locations. Paul, who was not with me when Babs gave the directions, was walking up and down Balboa Ave. and Clairemont Dr. dragging a bedsheet behind him to spread our scent. We learned later that we were contaminating the scene, spreading our scent more than we should and possibly confusing Doctor on how to get home. We didn’t get any sleep on Wednesday night somehow remembering to canceled our airplane tickets and hotel reservations in Alaska. During the brief time Paul and I were together at home (again with the front door wide open) or not camping out in front of the sitter’s home, we designed a 12” x 18” lost poster and sent it to Costco to be printed on photo paper. As soon as it was daybreak, we printed more color flyers at Kinko’s and began asking friends to post them around Doctor’s last reported sightings. We continued monitoring posts on NextDoor.com from Wednesday night/early Thursday morning. In one of those posts, we saw someone followed a dog who was hit by a car to nearby apartments. Unfortunately there were no specifics. Which apartments? Which direction? Did he make it across the barrier on the corner of Balboa and Clairemont? Babs didn’t think so and had me wait outside at the Canyon Villas. Meanwhile, we were also trying to speak directly to the person who saw him run away after he was hit for more details. We eventually found out she was a vet tech on her way home from CoastView Veterinary Hospital located on the corner of Balboa and Clairemont Dr.
Paul and Babs each spoke to the eyewitness but Babs came back with a more detailed report. According to the vet tech, Doctor was hit by a car, bounced back and went sprinting south on Clairemont Dr. The witness paced him following Doctor by car to a spot near Coral Bay Apartments. 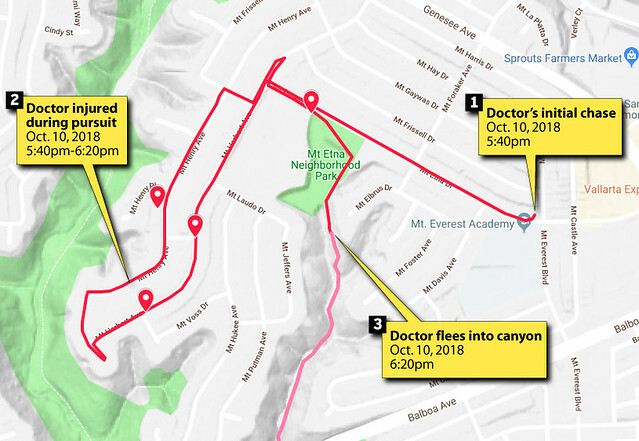 When Doctor noticed he was being followed, he eluded her running into Tecolote Canyon. 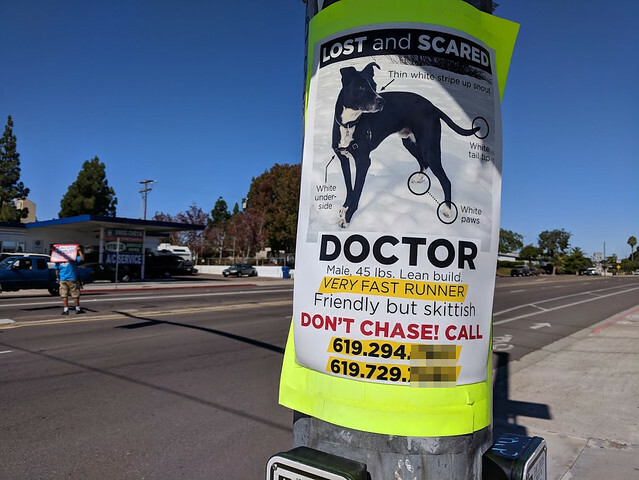 With the help of friends and volunteers who had seen our plea to help find Doctor, we were able to post flyers throughout the area he was last spotted. I also posted on Twitter, Facebook and Instagram, and started a new post on NextDoor.com asking people to please keep an eye out for him. My directions if he was spotted was very specific: do NOT chase. Rover.com by this time had launched a search party causing more harm than good. A volunteer who contacted me said that the last sighting for Doctor was at the Clairemont DMV on Derrick Dr. around 11:30 AM, only a block away from the sitter’s place. I called Babs about the sighting and she sent me to get a hot rotisserie chicken, camp out at the sitter’s place and wait. While waiting, she also asked me to call the eyewitness who saw Doctor at the DMV and ask for specifics: what condition was he, what direction was he headed, what side of the sidewalk was he on, etc. 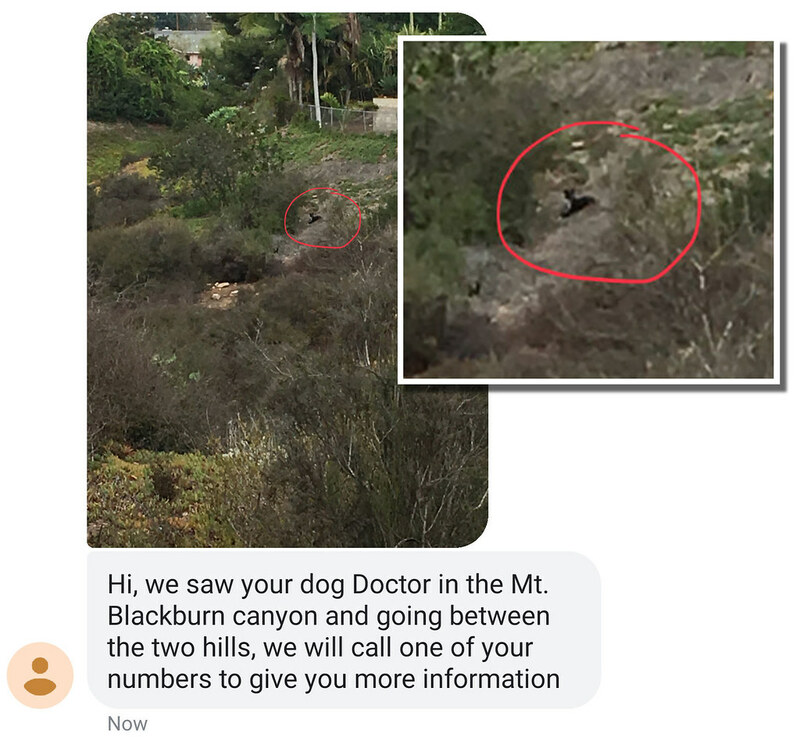 When I contacted Rover.com, the reported sighting was actually filed on Wednesday by the sitter (I don’t think Doctor was ever at that location) and the volunteer who called me about it assumed that since she got the email at 11:30 AM, is was when Doctor was also spotted. Paul and I were crushed at the false sighting. We continued splitting our time between our house and the sitter’s, putting up posters whenever possible. During Paul’s time near the sitter’s, he ran into a few people who were part of a dog-walking message group. Paul handed them flier and one of them told him their daughter had seen Doctor fleeing around the area the evening before (Wednesday, his escape night), which lined up with another neighbor who spotted bloody paw prints on the sidewalks eventually leading into the canyon via Mt. Etna Park. The roasted chicken I had bought the day before was still outside of the sitter’s home and Paul received an early morning text from the sitter that she had lost a client because of the food lure. Admittedly, yes the chicken still had bones in it but after days of no sleep, we weren’t making the right judgment call and didn’t think A) that the sitter would still be taking in clients while our dog was still missing, and B) the chicken would ever be left unattended. Paul and I became more desperate without any sightings and began making more posters to hang up, extending them as far north as Clairemont Mesa Blvd., as far west as Bay Park, as far south and east as Linda Vista Rd. Friends and volunteers who had seen my plea online also began driving the streets of Clairemont scanning for Doctor, some began exploring Tecolote Canyon and some hung up more posters (we couldn’t without risk of spreading our scent). 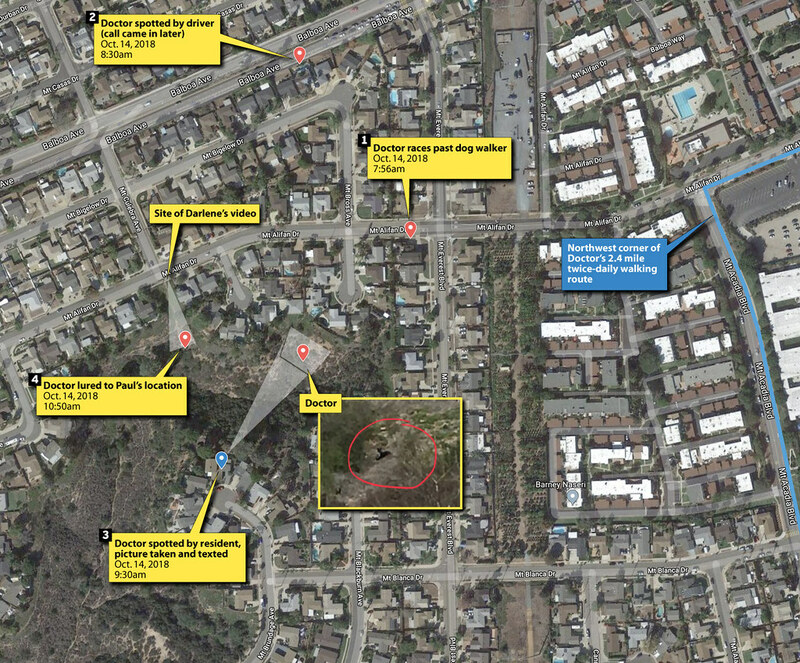 One of those volunteers, a Navy SEAL with tracking experience, investigated Doctor’s last sighting behind the Coral Bay Apartments on Clairemont Dr. and followed a solo set of dog prints in the canyon. The tracker was confident it wasn’t a coyote but a medium-sized dog and located a possible source of water for him to drink. The tracks ended at a split in the trail only a few feet away from Genesee Ave., roughly a mile south of our place. We were hopeful again but trying to keep our emotions in check at the possibly the tracks didn’t belong to Doctor but another dog. About an hour later the thunderstorm hit. Our emotions took another downward turn— would Doctor be able to find shelter? What if he’s in the canyon and there’s a slide or flash flood (it was a heavy cloudburst, not your typical light rain). Was he injured from the car hit and too weak to find safety? There were still no sightings and we hoped that Doctor would somehow make his way back home in time to celebrate Paul’s birthday that night. I spent all night downstairs on the couch with the doors wide open, my substitute birthday gift for Paul to make sure he got some rest. We had given up hope that Doctor would want to return to the sitter’s and focused on our place and the canyon. Sleep for us was still broken up: we’d wake up hours before daybreak anxious to do something. When Paul wasn’t sleeping, he was driving around the neighborhood in the twilight hours looking for signs of Doctor and seeing how the posters had held up during the rain. Things were wet but the sky was relatively clear the Saturday morning. More volunteers hiked the canyon, including a neighbor who brought his dog Bodie—one of Doctor’s best friends—but still no sightings. 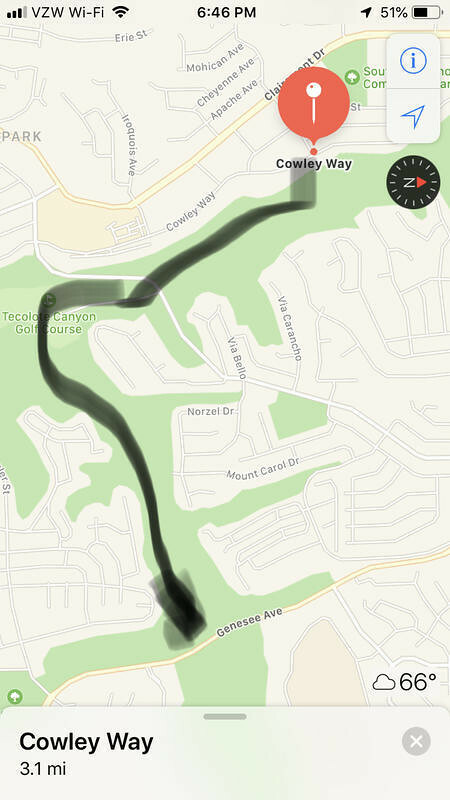 Another friend drove every road that was adjacent to Tecolote Canyon’s east edge and texted us his route(s). And another Twitter friend and her husband, a former U.S. Border Patrol with tracking skills, also combed the canyon for a Doctor sighting. 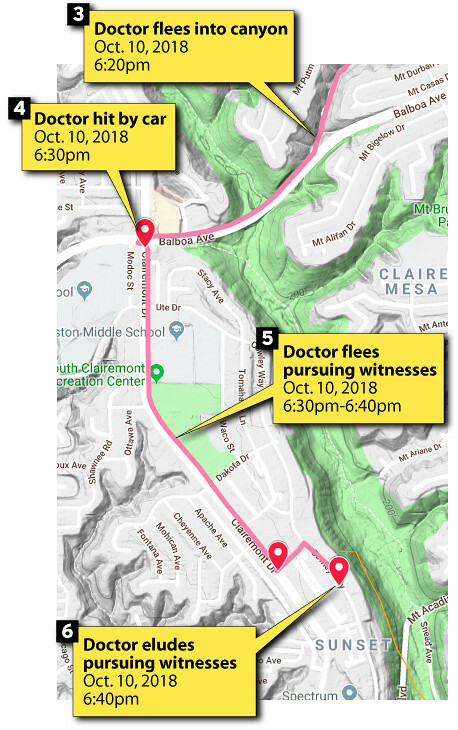 While stuck at home, I aimed my energy to posting to social media and created a custom map on Google noting Doctor’s Wednesday sightings, locations of posters, our walking route, where our home was compared to the sitters, etc. The map later played a crucial role in planning: it helped up to visualize a strategy and figure out where Doctor might be hiding. We were still receiving calls about Doctor’s hit-and-run from Wednesday night. One call came from a fourth eyewitness with a different vantage point from the other three eyewitnesses. Apparently, Doctor wasn’t hit by a car… he HIT the car. According to the eyewitness, while Doctor was crossing the intersection, a car made a turn in front of him and he ran into the car door. He bounced, got up, ran to the sidewalk on the east side of Clairemont Dr. and ran south (as all eyewitnesses claimed). That gave us a much-needed boost of optimism with hope that he wasn’t as badly hurt as we initially feared. After four days of no sightings, our spirits were at its lowest point. We used Thursday and Friday, our vacation days from work, to look for Doctor and couldn’t imagine how to continue a somewhat normal life and work routine while also continuing the search. At 7:56 AM, an eyewitness walking her dog on Mt. Alifan had just finished reading Doctor’s lost poster when he ran right past her! She called us immediately reporting that Doctor looked in good shape and was sprinting as fast as possible. Paul ran to his car and was more than halfway there when I called him back. During his short ride there, I called Babs to tell her of the sighting. She firmly told me to have Paul return home since he’ll possibly chase Doctor off with the warning that Doctor was currently in flight mode and wouldn’t respond to even our voices. I luckily got Paul to come back and discussed with Babs our next step. Our job was to cut up some unwashed laundry into 1-inch squares and put them in a Ziploc bag. We had to wait until 4:30 PM that evening to drop bits of our clothes every three steps leading from Mt. Culebra to a corner of our usual walking route, a distance was was separated by only two blocks. Also in that plan was to fill a spray bottle with chicken broth and spray it alongside the clothes. As we were cutting up the clothes and prepping chicken broth in a sprayer, Paul and I received a text at 9:30 AM with a photo attached. The photo was taken that morning was of a black-and-white dog hanging out at the top of the canyon. There was no doubt in our minds it was Doctor. We notified Babs again who call and interviewed the person herself. According to Babs, the second eyewitness reported that Doctor had been in the canyon for a while, hanging out and even napping. Using Google Maps’ satellite view, we all determined exactly where Doctor was hiding and immediately switched our gears to a new plan. Hearing Babs think out loud was thrilling. Was Doctor crate-trained? Did he enjoy being in a crate? This was an option in case we needed to set a trap at the location with our dirty clothes and hot food as bait. Instead she sent Paul to the next trail over from where Doctor was hanging out. Paul was instructed to bring a smelly, hot deboned chicken and blanket with our scent. Babs gave a stern warning that it may take several hours of waiting and it still may not produce Doctor. Do not get our hopes up. 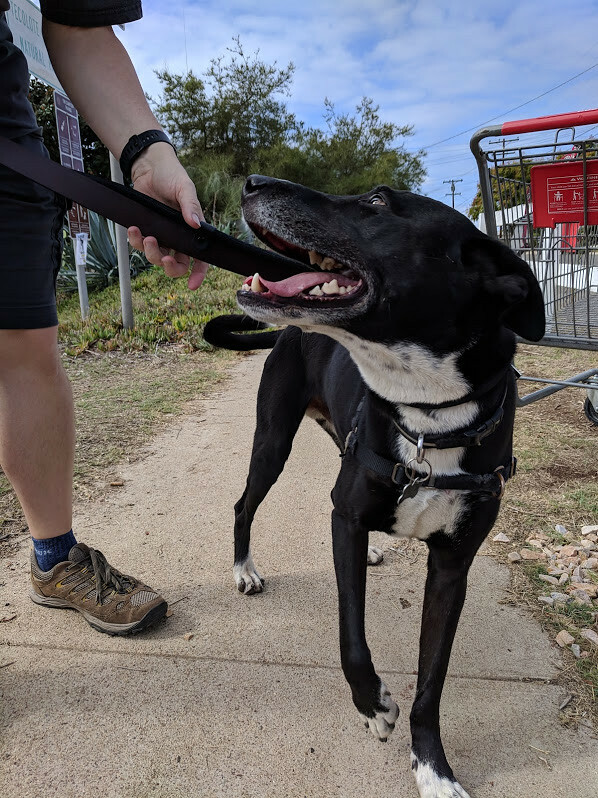 I was instructed to buy a slip leash for each of us to capture Doctor (we wouldn’t be able to get a hook on his regular leash if he was still in flight mode, and that collar would like slip off). After dropping off Paul, I went to PetSmart to buy a leash, and returned to the Mt. Alifan and Mt. Culebra canyon entrance. As I began texting Paul that I was back and heading to his direction, I saw Doctor and Paul walking up the trail. Doctor saw me, began to sprint while dragging Paul behind him. Paul’s reunion with Doctor was only a few minutes before mine. I packed up water, some food, a cell phone battery pack and food lure for Doctor, thinking he might be spending hours sitting in one spot. As instructed, Paul wasn’t supposed to call out or make a sound but remain silent and still with the chicken a few feet away from where he was sitting. Paul had a idea while he was sitting here. He was wearing his belt and remembered every time Doctor would hear the jingle from the buckle, he’d come racing upstairs knowing it was time for his walk. Paul removed his belt, let it jingle once. He followed it up with second jingle. About 45 seconds later he heard a rustle from the trail behind him. From the the corner of his eye he spotted a black silhouette stop at the chicken and then recognized him. Doctor pounced on him, crying with happiness and relief as dogs do, with no desire to run off. Paul put Doctor’s harness on him and used his belt as a makeshift leash. He’d only barely packed up his “camp” before I arrived at the top of the trail and Doctor started racing toward me. Thanks Ren. I really appreciate your concern! I was so caught up in your search for Doctor as you were trying to find him. A happy ending, indeed. That video says it all! I think one of the most difficult aspects of travel is finding the right solution to care for our loved pets. It always worries me. Happy reunion to you all!